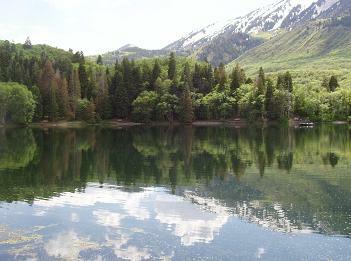 Maple Lake is a beautful, shallow lake a short ways up in Payson Canyon. Fishing can be fair to good for small Brook and Rainbow Trout. Take I-15 to Payson Main Street (Exit 260). Head south on Payson Main Street until the stop light junction with HWY 198. Turn right (south) onto Canyon Road (600 East) at the Peeteetneet School. Head south and follow the road several miles up into Payson Canyon until the turnoff for Maple Lake, which is marked with a sign and is on the right. Follow that road back towards the northwest for a mile or so to Maple Lake.